Description: New 4 ft. tall x 8 ft. wide pre-fabricated Stud Grade fence panels (sections) built on 2 – 2 x 4 Pressure Treated Pine or Brite White Wood Rail, you choice; Round Head 6d ring shank galvanized 1-3/4″ x 13 ga. (.099″) nails. 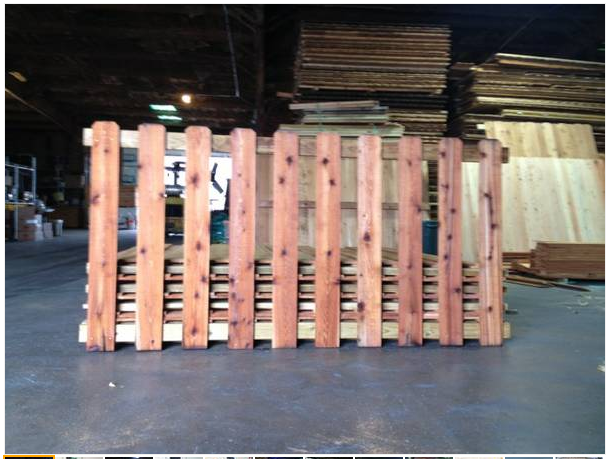 The pickets are Western Red Cedar 1 x 6’s (11/16″ <≈> 5/8″ x 5-1/2″ actual). Available in pre-sealed/stained panels for additional charge. Condition: New, freshly built (we build to order) These panels are fabricated here at our shop . . . it’s the only way we can maintain consistency. It’s also the only way we can be completely sure that, as components or assembled sections, these panels have never been stored outside . . . a common practice of the big box home centers here in the metroplex.